The Hobbit: An Unexpected Journey had its world premiere this morning in New Zealand - we've got pictures of all the celebrity red carpet arrivals and more, including Peter Jackson, Andy Serkis, Neil Finn and more. Preparations for the stars' arrival at the Wellington premiere of The Hobbit. The man behind it all - director Peter Jackson. The stage is set to receive the stars of the movie event of the year, The Hobbit. Arriving in Wellington in their very own branded Hobbit plane, it's the movie's cast and crew. Former Dr. Who star Sylvester McCoy plays Radagast The Brown in The Hobbit. He's still got a scarf on, though. In costume as Gandalf the Grey, one fan is clearly very excited about The Hobbit. William Kircher arrives in a flamboyant white suit at the premiere of The Hobbit. Elijah Wood makes a return appearance as Frodo Baggins in the new Tolkien-inspired movie. More Lord Of The Rings fans at The Hobbit premiere, this time dressed as elves. Andy Serkis reprises his role as Gollum for The Hobbit, again aided by incredible CGI. Even the airport staff have been Hobbit-branded. The coolest way to get to Wellington. Emerging from Bilbo Baggins' house, it's The Hobbit's director Peter Jackson! Evangeline Lilly arrives at the premiere for The Hobbit in Wellington, New Zealand. Neil Finn performs at the Hobbit premiere - he co-wrote one of the tracks from the film's score with Howard Shore. Titanic director James Cameron arrives at the premiere for The Hobbit. Cate Blanchett is among the actors making a return to the LOTR world, reprising her role as Galadriel in The Hobbit. The movie's stars take a bow on stage at the Wellington premiere. What better way to arrive than in a Hobbit-branded plane? Even the New Zealand Post Office is getting behind The Hobbit. Where the premiere screening of The Hobbit is due to take place, The Embassy cinema in Wellington. 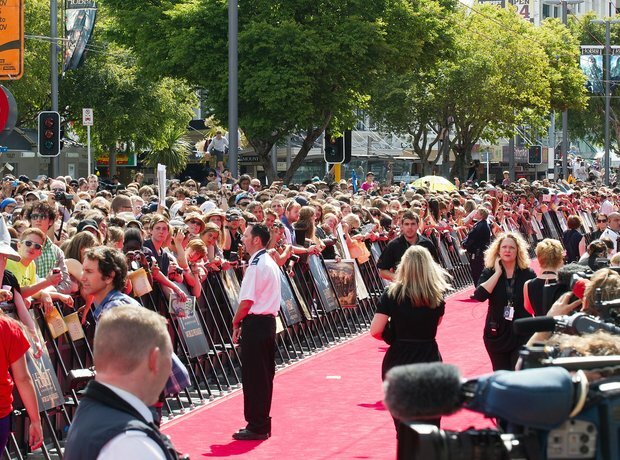 Anticipation in Wellington is huge for the premiere of The Hobbit as crowds assemble to catch a glimpse of the movie's stars. Barry Humphries, better known as Dame Edna Everage, arrives at the premiere of The Hobbit. He plays the Goblin King in the film. Looking slightly more healthy and dressed-up than he does as Gollum in the LOTR movies, it's Andy Serkis. Well, it is a long way to walk up the red carpet... Stars Jed Brophy and James Nesbitt take a golf cart at The Hobbit premiere. Proof that New Zealand is totally behind The Hobbit - New Zealand's Prime Minister John Key at the premiere. Peter Jackson takes centre stage as the Prime Minister of New Zealand looks on. Greeted by director Peter Jackson, British actor and Bilbo Baggins himself Martin Freeman arrives at the premiere of The Hobbit.